A seemingly odd article from the Catalysis Research Center and Institute of Silicon Chemistry, the presentation of an aluminum to aluminum double bond compound (Bag et al. DOI) but silicon has everything to do with it. This dialumene (Al=Al) in question is stabilised by two NHC carbene ligands both by electron donation and by steric shielding. More shielding is provided by two di-t-butylmethylsilyl groups. This compound is stable despite the highly reactive Al=Al bond. The geometry is trans-planar with a record-small Al-Al bond length of 2.39 angstrom. 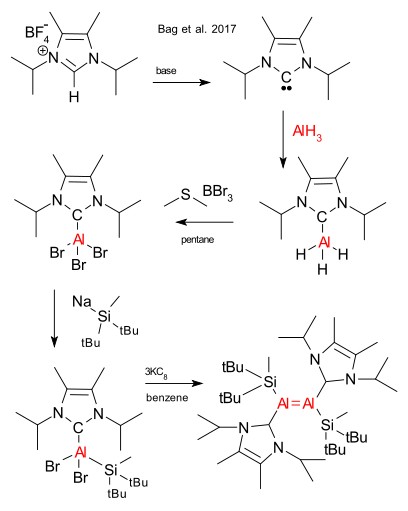 Reaction with ethylene yields the 2+2 cycloaddition adduct as an isolable compound. In the reaction with phenyl acetylene the compound also behaves as a regular double bond compound.